Like stalking rare animals in the wild, I set out trekking through Hanna Park, hoping to capture a glimpse of an artist “Painting the Region.” Hanna Park in Mayport, Jacksonville, is a gorgeous area with a lake and beach access. After many stops, hikes, and beautiful distractions, I spotted a lone artist. She was in such a remote place — with a spectacular ocean view — that I tried a couple of hiking paths to reach her, to no avail. I settled for a distance shot and felt very inspired by the beauty I had seen and the images I had captured on my camera of lone surfers and stunning views. It was the first day of an event where artists would spend five days in different coastal regions of Northeast Florida creating a painting a day. The culmination of the event would be on Saturday, with all the art being shown and available for sale at a reception at the Ponte Vedra Cultural Center. All the proceeds go to the North Florida Land Trust. This third annual Painting the Region event in Northeast Florida featured coastal locations. Artists from around the region, as well as from other states and even as far away as Italy, could be spotted throughout the week, painting in generally-designated areas each day. 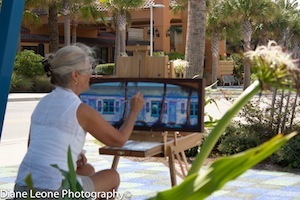 The public was invited to watch the artists as they brilliantly captured the beauty of the area. After I found the elusive artist in Hanna Park, I fared better in Old Mayport. On the other side of A1A, with marvelous views of shrimp boats and a quaint old fishing village juxtaposed with the Coast Guard and Mayport Naval Air Station, I found a group of artists painting shrimp boats and a pair of beautiful red vessels. Quietly they went about creating their art. What a great job! The weather was perfect on this first day of the paint-out. Tuesday, I packed up my gear and drove to Old Atlantic Beach. Each day, the drive along the coast on A1A alone was amazing. Old Atlantic Beach epitomizes the quaint old Florida beach town. I found one artist standing at a busy five-way-stop intersection, deep in the heart of the Atlantic Beach community, painting a grand sculpture of a woman/mermaid riding a giant sea turtle. I was just about to give up on my MapQuest directions to the next artists’ location when I spotted an artist on a quiet road next to a park with children swinging and laughing. He was capturing a classic street scene of old homes and palm trees. I feel compelled to point out the obvious at this stage — there were palm trees at each scenic location. I mean, it is, after all, coastal Florida. 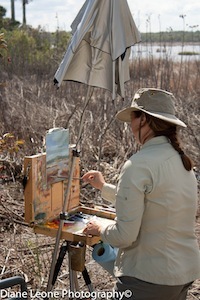 On Wednesday the artists were painting the Guana Preserve in St. Johns County, a stunning, protected area along the west side of A1A on the intercoastal waterway with the Atlantic Ocean just across the highway. 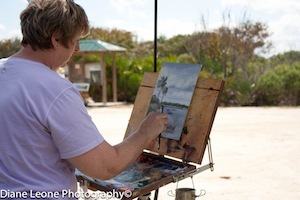 I easily found a large group of artists at a spectacularly scenic spot along the preserve, with each artist staked out in a location to capture just the right view. Silent and windy, with blue skies, the marshy area was filled with brown reeds, greenery, blue water and birds. The occasional kayaker would come and go at the boat ramps, but otherwise, it belonged to the artists. They were getting a lot of support from passersby, with shout-outs and honking horns of support. All the artists were willing to share their stories and their visions for the artwork they were creating. It’s quite calming and satisfying to watch artists do their magic and to observe how they interpret what they see and how the same view can look so different from artist to artist. 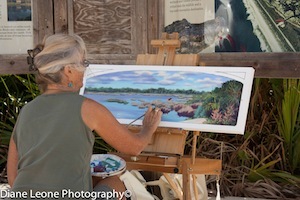 Thursday the artists were to be found either at Guana or Hanna Park painting ocean scenes, lake views, and intercoastal masterpieces. On Friday morning, the rain clouds were out, so my journey to Vilano Beach in St. Augustine started in the early afternoon as the sun and blue skies returned. Vilano Beach Village (the entrance to Porpoise Point, a piece of land that juts out into the ocean and the intercoastal) is a beautiful place where two bodies of water meet and porpoise are often seen playing in the surf. An artist from Italy was set up on the pier, capturing the coastline of Porpoise Point and the rain clouds that had filled the sky. The artist, based in Rome, had been painting in Italy for seven years and was in Vilano Beach this day capturing a different but equally striking image — old coastal Florida. At the other end of the main drag between the pier and the ocean, I found an artist painting a run-down, closed hotel with pink flamingos on the shutters. A true beauty in its day — and in the artist’s vision as it spilled onto her canvas. A man riding by on a bike stopped to ask her about it. All in all, this is a truly unique event and a way to not only see with your own eyes some of the most dazzling coastal views in Northeast Florida, but also to spend lazy mornings and quiet afternoons watching artists capturing the same stunning views. You’ll watch in amazement as each canvas reveals a different interpretation of the same scene. The North Florida Land Trust permanently preserves natural areas and special places in North Florida. This event will help fund the cost of creating the Conservation Resource Center, which will be established by purchasing and renovating the landmark Old Oar House Restaurant property on Mickler Road in Ponte Vedra Beach. For more information on the North Florida Land Trust go to www.NorthFloridaLandTrust.org and for more information on this unique event go to www.PaintingTheRegion.com. The event is free for visitors and locals alike and is a wonderful way to explore some tucked-away views and to see them through the artists’ eyes.